The 2015 Santa Barbara County Road Race started off the road racing scene in SoCal for those who wanted to test their early season fitness. The men’s Pro 1/2 field rolled off with a respectable sized field that brought a handful of big names. Some of these names came all the way from Canada who represented Silber Pro Cycling. With perfect Southern California weather, the race was easily predicted to bring speed, suffering and sweat stains to whomever passed the start line. The race was quickly established just after the first lap with a breakaway of about 11 riders. They continued their lead on the pack and always kept their advantage several minutes ahead. Although, the race behind was very tense as riders from the break were being slowly caught. The field continued to attack each other in order to form the chase group and on the fourth lap a chase group of six riders went clear. As the bumpy roads and warm conditions wore on the rider’s legs in the last half of the race, the front group dwindled to six riders who battled it out on the final lap. 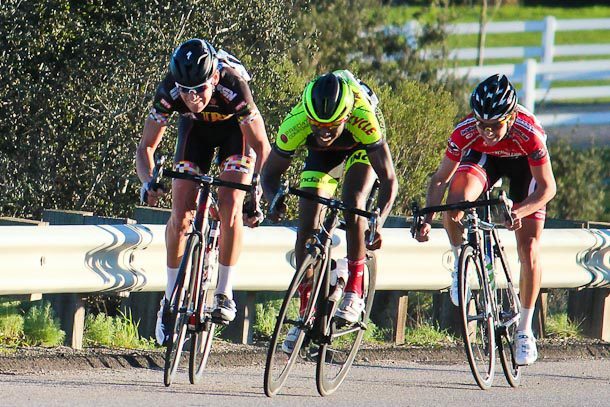 The race was finally won with a fast downhill sprint finish with Benjamin Perry (Silber Pro Cycling) sprinting against Stefano Barberi (Cal Giant) and Alexander Cataford (Silber Pro Cycling.) Perry took the top step and the Castelli winner’s jersey, while Stefano Barberi (Cal Giant) took a hard earned 2nd place and Alexander Cataford (Silber Pro Cycling) took a respectable 3rd. I managed to sprint in with a small five man fragment of the 12 man break to finish 10th for a consistent showing for the past few weeks in the early season races. On another note, it was good to see the new SoCalCycling.com riders coming out of winter training to get in some early season races. Good job to the SoCalCycling.com Team for toughing it out, considering Zane Torre had a broken shift lever and had to borrow a bike for the race and Steven Davis for completing the race on a 10 speed wheel after flatting on the start and grabbing a wheel while using a 11 speed shifter. We’re looking forward to this weekend’s Boulevard Road Race and Red Trolley Criterium. Thank you to all of our sponsors – SoCalCycling.com – Your Cycling Source, Cannondale Bicycles, Sugoi Performance Apparel, FULL SPEED AHEAD, Pacific Premier Bank, ROL Wheels, Clif Bar, fi’zi:k, Echelon Design, Incycle Bicycles, Continental Tire, KMC Chain, TRP Brakes, Larsen’s Restaurants and the Ontario Police Officers’ Association.